We’ve had two very hard frosts at Poison Ivy Acres, but a couple of plants continue to flower as if it was August. The asters may have a few feeble flowers, and the feverfew offers a blossom or two, but Lobularia Snow Princess, and Nicotiana mutabilis are in full, glorious bloom and are beautiful. I can’t say enough about the Snow Princess alyssum. It is reliable in sun and part-shade. It stays thick, full and in flower from May until well beyond the November Garden Bloggers Bloom day. If you’re planning a party, family reunion or wedding in September or October and want to be sure to have flowers, this is the plant for you. It’s unfortunate that the hummingbirds have left for points south because one of their favorite flowers, Nicotiana mutabilis, still graces my gardens. I ordered this plant a few years ago from Avant Gardens and was immediately hooked. Now I grow it from seed every spring and usually get a self-seeded plant or two where it grew in the past. This annual is tall, sturdy, and constantly in bloom. Not to mention that it laughs at frost…it takes actual winter to kill this one. 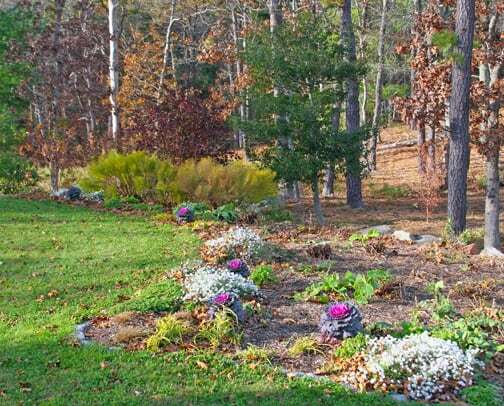 As I gaze out on the gardens on this November Bloggers Bloom Day, it’s hard to believe that next week is Thanksgiving. Holidays aside, I am truly, totally thankful for flowers in the fall. 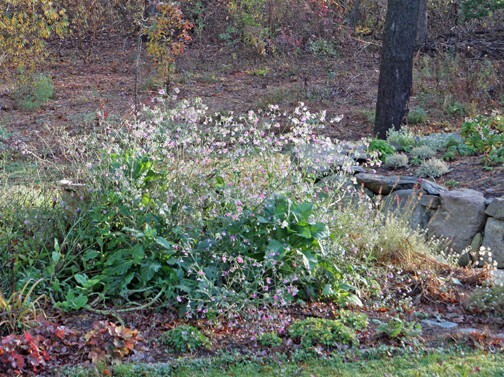 The lakeside perennial bed has been mostly cleared, but the ornamental kale and Snow Princess alyssum continue to provide color and bloom. Not only does this Nicotiana continue to flower, but young plants are still growing! I guess I should be glad that winter does, finally, kill this plant...otherwise it would take over the garden!